Today I'm sharing a yummy cookbook review with y'all! Not just any cookbook, but the newly released Southern Bite Cookbook! This beautiful southern cookbook was released on Tuesday March 11th, but I was lucky enough to score an advanced copy to drool through. 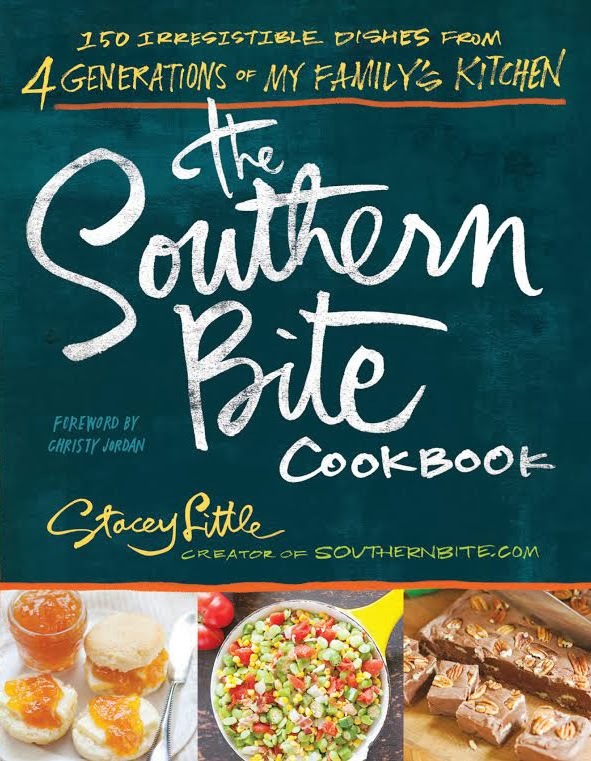 This beautiful cookbook is written by my friend Stacey Little of SouthernBite.com. If you love simple southern food this cookbook is a must have, and I'm honored to add this beautiful book to my cookbook collection. The Southern Bite Cookbook is filled with 150 southern dishes passed down from 4 generations of his families kitchen! Stacey is a simple man with a big heart and a love for food, family and heritage. And in the south that's a big deal! When Stacey announced that he was writing a cookbook I knew right off that it would be nothing less that a hit. All of his recipes call for simple ingredients and pantry staples which is the definition of southern and country cooking. If you have a love for southern food like I do you'll immediately appreciate so many of these great recipes. I'm so proud to call Stacey my friend and even more honored to have met him in Person. All I can say is Stacey's a hoot and definitely a keeper. I have so much fun every time I'm around him and he has such an infectious personality. This beautiful cookbook was written with a labor of love and it show's through on each and every page. Stacey, ya did good my friend! The photos in this cookbook are not only beautiful, but inviting and mouth watering to say the least. Each and every photo takes you back to your mother or grandmother's kitchen. Fried chicken, pimento cheese, pulled pork, stuffed peppers, succotash, chicken pot pie, fried green tomatoes, roasted garlic chicken, meatloaf, smothered pork chops and the south's famous comeback sauce is just a sampling of recipes you'll find in this delicious cookbook. Oh and let's not forget the desserts!! The Southern Bite cookbook is packed full of so many of my favorites, Lemon ice box pie, Dr. pepper cake, buttermilk pie, scratch brownies, pound cake, red velvet brownies and his mom's peach cobbler. Stacey was also generous enough to include recipes from his southernbite.com readers, so just might find a recipe in their from yours truly!!!! Now onto the recipes that I chose to make. First on the list was this easy-peasy Hot Tomato, Bacon & Chicken Pasta. I was in a pinch for dinner when we returned from Spring Break and I had everything on hand to make this wonderful pasta dish. This recipe honestly falls under what we call a pantry staple recipe. I even took Stacey's suggestion and added chicken to turn this side dish into a entree. Everyone loved it and it and I literally had dinner on the table in 30 minutes. Cook the pasta according to package directions and drain well. In a large skillet over medium heat, fry the bacon until crispy; then drain on paper towels and crumble. Drain all but 3 tablespoons of the bacon grease from the pan. Return the pan to medium heat, add the onion and cook 7-8 minutes or until the onion is translucent. Add the garlic, tomatoes with juice and chicken. Add salt to taste and reduce the heat to low, and simmer for 20 minutes. Add the crumbled bacon to the sauce and toss the pasta. This next recipe is no stranger in my house! I have made these yummy Pecan Chewies more times than I can count. They bake up golden brown with a rich chewy center. This was one of the first southernbite recipes I tried a few years back, and I've been making them ever since. Add beaten eggs, stir well. Add flour and stir until all lumps are gone. Add pecans and vanilla. Pour into a greased and floured 9 x 13 baking dish. Bake approximately 40 to 50 minutes watch closely so they don't over cook. You want them to retain their chewiness. This Giveaway is now Closed! The Winner of the Cookbook & 6 - QT Slow Cooker is Comment #98 Colleen Bohn! 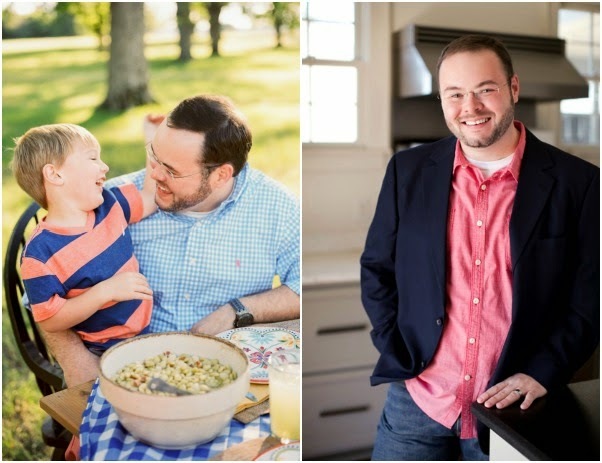 To celebrate the release of his new cookbook, Stacey is offering one Mommy's Kitchen reader a chance to win a signed copy of the new Southern Bite Cookbook, and a Hamilton Beach 6 - Quart Programmable Slow Cooker. What an awesome combination if you ask me. I don't even own one of these fancy schmancy slow cookers. Just leave a comment on this post telling me what dish that you make that reminds you of home? 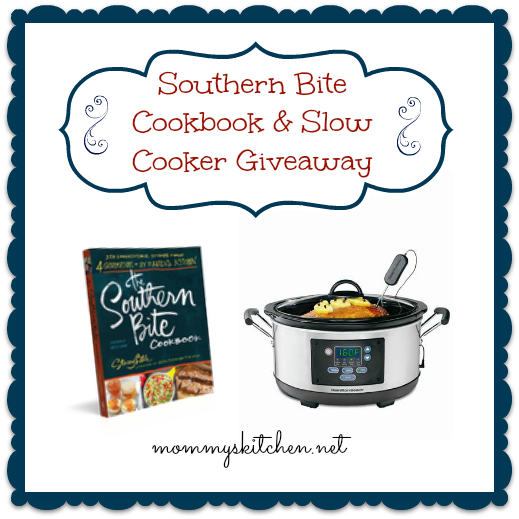 Tweet the following for a bonus entry: Win a copy of The Southern Bite Cookbook & a 6 Qt Programmable Slow Cooker @mommyskitchen @southernbite http://tiny.cc/kc3pcx #giveaway (Leave a separate comment for bonus entry). Giveaway starts today, March 14th, 2014 and ends on March 20 st, 2014. Contest is open to U.S Residents that are 18 years and older. If you leave an anonymous comment please include your email address in the event that you're the winner. Winner will have 48 hours to reply to my email or a new winner will be chosen. Good Luck! You can follow Stacey Little on Southernbite.com as well as on Pinterest, Face book, Twitter and Instagram. Disclosure: I was given an advanced copy of The Southern Bite Cookbook for the purpose of this review. An additional copy was also provided to use in a reader giveaway. All opinions stated above are 100% entirely my own. My favorite dish that reminds me of home is my Mom's Chicken & Dumpling Soup. I think it was everyone's favorite! I am going to make those Pecan bars they sound really yummolicous. I would love to have the cook book. I love crock pot cooking so the Crock Pot would be a bonus. My favorite dish that I make that reminds me of home is Swiss Steak! My mothers chicken and dumplings rolled out and cut. I make them but they will never taste like hers. My mom is from Korea, so cooking any type of Korean food reminds me of home. However, if I am really missing home I will make a nice big pot of kimchee soup, yum. Liver & onions, & meatloaf. Chicken and dumplings and fried potato's and cornbread..
Chicken and dumplings and almost every recipe here. I would have to say the one thing that reminds me of home is my Mom's Cat Head Biscuits and Sausage Gravy. I make this myself about once a week, mostly on Saturday's, and when I take that first bite....I'm back home again in my Mom's kitchen. Watching and learning how to cook from my Mom. Mom died in 2005, but not before leaving a wonderful legacy of recipes for her 5 daughters to use. My Grandmother's yummy potato soup reminds me of the old days. Luckily she taught me how to make it just like hers. No recipe..just watching her. My family swears it's the same. My favorite recipe that reminds me of home is my mother's Tuna Casserole. It probably came off a can of cream of mushroom soup back in the 50's. We always had it for Friday and Lent. Now I or someone in family makes it when it get chilly outside. So easy. THanks for being here. Would love to win. The dish that always reminds me of home is my Dad's bacon gravy, he would make it for us once a month on his day off if that day off was a Sunday. He would always use slab bacon, never the bacon that comes pre-sliced. I miss this dish and him very much! Roast turkey. My mom made it all the time--even at the beach! Creton or Gorton, which is a French meat spread always says home! The dish that reminds me of home is a big pot of chilli. My made the BEST chilli! I miss her. My favorite dish that reminds me of home is Potato Filling. It's Pa. Dutch mashed potato casserole. But mine never turns out as good as my mom's. The Lemon Ice Box pie makes me think of hot summer days and cooling down with home made lemon pie. Thanks for the contest . A big bowl of chili, and a huge slice of pound cake! Hi my name is Hailee. Greens (collard) & southern (style) cornbead, reminds me of home. I love to put the pot liquor from the greens over my cornbread and enjoy! This is Cheryl. Fave crock pot dish is home style pot roast with veggies! I would say fried chicken, mashed potatoes, pinto beans and corn bread. It reminds me of my grandmother's Sunday dinners. She passed away when I was 13. Those dinners were the best. I always think of home when I smell the wonderful aroma of pot roast and fresh baked yeast rolls. chicken salad (the grapes and pecan kind) and popovers say home to me. This was my fav lunch. Mom made it for us when Dad was not coming home, as he did not care for either one. They are both gone now...and this lunch brings them closer. The Pecan Chewies sound exactly like my grandma made. My Mom used to make what she called pigs in blankets. It was round steak strips wrapped in bacon secured with a toothpick. Then she fried them and simmered them with some water, which made the meat tender and a wonderful juice which she thickened into a Rich gravy. All was served over wide noodles. Mmmmm! I think I know what tomorrow's dinner will be! The thing I always go back to when I want to think of home is Thanksgiving dinner!! Turkey, stuffing, green bean casserole, mashed potatoes......YUM!!!!! Oh wow. I love your blog, and your recipes! Thanks for this chance to win. Hmm, my favorite recipe to make that reminds me of home is Lasagna. It's so gooey with all the cheeses we use ( We use 4-8 different kinds!) and so filling with all the meat. Yumm!! Definetly my Grandma's Rhubarb Cream Pie, the recipe just takes me back to the days of loved filled times. Chicken and dumplings remind me of home.........so, so good! Favorite meal that reminds me of home are baby back ribs with baked potatoes and corn on the cob. My grandmother made the best apple and peach dumplings ever! I use her recipe but make them a little different. The dish I'd make that reminds me of home is Slow Cooker Beef Stroganoff! My favorite meal to make is beef stew with tomatoes and corn added with the regular vegetables. Meat loaf, with mashed potatoes, and green beans. One of my favorites is my Mom's hash - usually made with left over roast, potatoes, onions and gravy. We bake it until done and serve it over bread - yum! Roast with potatoes, carrots, onions, & celery. My stuffing at Thanksgiving and Christmas reminds me of home! Mom would fix green bean, potatoes and sausage in the crock pot. I don't know what she did to them to make them taste so good. I just remember never getting enough of them! Ham, broccoli and cheese casserole reminds me of home. Back as far as my 60 years remembers, our family has enjoyed Coke-a-Cola Salad! It is so good and refreshing! We have it as a salad or a delicious dessert! My favorite dish to make that reminds me of home is homemade mac and cheese. So good! Pumpkin pie reminds me of home and holidays. My moms Hot Tamale Pie. Everyone I've ever made it for loves it. Most have never heard of anything like her recipe. I love your recipes and have made several. And I like being able to share them on Facebook. I don't know how many of my friends have signed on with you but if they haven't they are really missing out! My Mom was a very good cook. Hard to pick one. But she would make Blackberry Cobbler but I didn't like the seeds so she would make me Blackberry Dumplings with the strained juice. Miss her so much. I love all kinds of recipes. My mama made the best biscuits and everytime I eat a scrambled eggs sandwich, I think of her. Home made dinner rolls always remind me of home. My Mom's Homemade Banana Ice Cream! My mother use to make pasta with her home made spaghetti sauce, comfort food done the Italian way. I make it now, but not quite like Mom's, that was special. Homemade chicken soup with Norwegian dumplings is what reminds me of home. beef stew always reminds me of my grandmother. Also I have been trying to find the recipe for blueberry coffee cake that she made. It used corn flakes as the topping. I miss it and her. It would have to be Chicken & Dumplings! I love them! Course your green tomato relish plays a close 2nd!! Thanks for great Recipes Tina! My favorite recipe that reminds me of home is chicken and dumplings. My mom made the BEST lemon meringue pie, fried/steamed thin porkchops & tomato gravy. The dish I make that reminds me of home is Chicken and Noodles served with green beans and coleslaw. My email address is susiebreyesnana@gmail.com. Of course being from Maryland, I'd have to say Steamed Crabs always reminds me of home sweet home. Thanks!!!!! Meatloaf, pinto beans with a ham hock, buttermilk cornbread and lemon meringue pie....yummy & home. The one dish that I make that reminds me of home is Mac n Cheese. The dish that reminds me of home would be my great-grandma's slow roasted oven bbq chicken. OMG!! The best,no joking, I can taste it now. A family staple in Memphis, TN! Thx for allowing me to go back in the day. Oh my goodness there are so many, but the most favorite is thick, chunky beef stew with homemade rolls!! That cooker and cookbook look awesome. Dish that reminds me of home is pot roast served with smashed potatoes and fresh veggies from the garden and of course mom's homemade bread along with dessert of sorts....basically our Sunday meal. The dish that reminds me of home the most is my parents Pot Roast-(they always prepped & cooked together)-Imake it, but it's just not same as when i was growing up. Nothing really reminds me of home because I didn't learn to cook from my mother. I love making steak and gravy with mashed potatoes because it reminds my father of home, when he was younger, and his mother and father were alive. Nothing makes me happier than to give those memories to HIM when I cook. My moms pork and squash dish. LOVE it! Really, everything my moms cooks. Home and Mom is chili every Friday night. Another favorite - my Mom's liver & onions with boiled potatos and lima beans. Oh my! I would love to win. The cookbook looks super and I would love, love a new slow cooker. Thank you for the opportunity! Fried chicken, mashed potatoes, home canned green beans and fried corn. Hands down, Chicken and dumplings...old fashioned rolled out dumplings, Grandma Forster made THE BEST! She has been gone since 1992 and I still think of her every time! My mom's fried okra, creamed corn, macaroni & cheese, and fried chicken always make me think of home. Doesn't get any better than that! Yummmmmmmmmmmmmmmmy! I am making this Hot Tomato, Bacon and Chicken Pasta tomorrow after church for our lunch! My kids love all those ingredients. My favorite home recipe from my mom is her Meatzza Pizza. Whenever I make egg in a nest it immediately reminds me of my Dad. He would often make a big breakfast on weekends. Also, whenever I make salisbury steaks, I get transported back in time to my dear Aunt. She was like a mother to me. Good Luck everyone! My grandmother's homemade biscuits! I would love to win this! Navy Bean Soup does it for me. I always think of my Mom, she never really liked it but she made it for us. The peach cobbler that my family has made for generations..so easy and so delicious..i have an aunt that made the best lemon glazed cake,but i never got her recipe before she past away and her kids don't know how she made it..but i am always trying to make a lemon glazed cake to remind me of her..it was so moist and delicious and i dont even like lemon cakes..except hers...would love to win the book,my husband would take over the crockpot..he cooks most everything in a crockpot.. I have been trying to figure out my grandmother's Swedish meatball recipe. Each time I make it I feel i am getting closer to her recipe and feel she's right there with me. She would make them every summer for us to feast upon. We don't have a recipe but I have made it a goal to figure it out so that my family and I can journey back in time to those amazing summer memories with just one bite. And then we in turn can pass the stories and food onto our own children. Love all recipes. The ones I enjoy the most is the fresh yeast rolls and the all in crock pot pork chops! I make my mom's Baked Spaghetti. She used to always make it so it reminds me of home. My favorite dish that reminds me of home is my Grandma's cornbread pudding. She was the only one who could make it just right. Butter and saltines. My great grandmother used to make this when we visited. Funny how somthing so simple makes me miss her. Biscuits and cornbread, the aroma coming out of the oven is just homey, and they taste great too! It's not just a dish that reminds me of home. Growing up on the lake, it's a good old fish fry. Fresh cought fish, cold slaw, baked potato, corn bread, and homemade ice cream! My grandmother's big pot of Seafood Gumbo, rice and you can't forget cornbread. Louisiana comfort food. My mother's fried chicken and mashed potatoes with pan gravy she made from the drippings of the chicken. I asked for that every year for my birthday dinner. It was so good!! The dish I make that reminds me of home is chili. We always had chili and bread with butter. Always good for a cold Michigan winter. 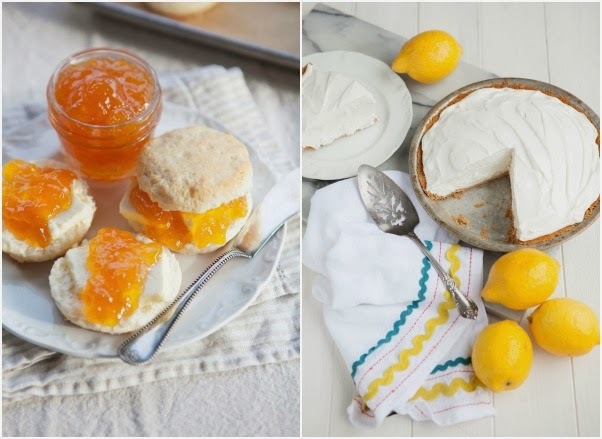 The South sticks with you in a warm, sweet kind of way, just like its foods do! I was born in Atlanta, raised in South Florida, and have lived in California all of my adult life! Reading these recipes and seeing the photos makes my mouth water and thoughts of my Aunt Polly's cooking come up with sweet memories! I love to prepare these types of foods and am thrilled that there are books like this one being published in 2014! You truly can take the girl out if the south but never the south out of the girl! My grandmother made the best coconut pie. I'd love to be able to make one as good as hers. 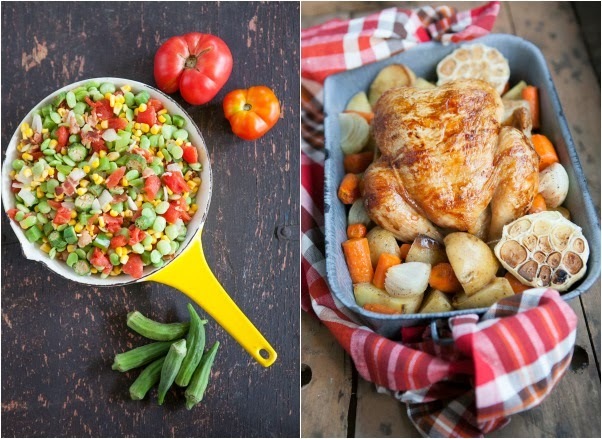 My favorite recipes that remind me of home is my Dad's chicken stew. It was simple and very good even for leftovers the next day. But, I made a little change though. I made a white gravy to make it thicker and it did not change the taste at all, matter of fact it made it better. Homemade biscuits reminds me of home. When I was growing we had them everyday. I made some just this morning. I'm from Mississippi & we love our bread! Mom'm chili or mac n cheese are the best! My favorite dish that reminds me of home is Sunday roast beef. Chicken and sausage gumbo---UMMMMMMMMMMM!!!! When you drive up in the driveway and open the car door, the first thing you smell is the roux----then you know you are home. My Mom mad the best Dough Soup which was like Chicken and Dumplings but was Beef with Pot Pie Noodles. I have made it but it is never the same. Love to win the cookbook looks great and with being on SS it is nice to win something. My brother used to make beef stew when I was sick. He knew it was about the only thing I would eat besides apple sauce! Thanks! Baking the Pecan Chewies right now! Oh how the house smells yummylicious! I have several recipes from both of my Grandmothers and my Aunt who helped teach me to cook but the one that really takes me home to my Mama Smith's kitchen is her pot roast in gravy, she made the best pot roast in the world and I never think mine tastes as good but my family loves it. Love the book, love your blog and love Stacey Little. The recipe that reminds me of home is for Molasses Cookies. The recipe is from my grandmother and it was my dad's favorite cookie. This is a wonderful giveaway! Chicken soup always reminds me of home. My Grandmother Grainger and my Mom's Chicken and not Dumplings, but as my grandmother called it, Pastry. Nothing could taste better than that. My fave is my grandmothers banana but cake, chicken n dumplings and fried okra. My mom's stuffed cabbage, and with the leftover rice she would make the best baked rice pudding. My mom never used a recipe and I wish I knew how she made it. I never thought to ask her and write it down and now its to late. 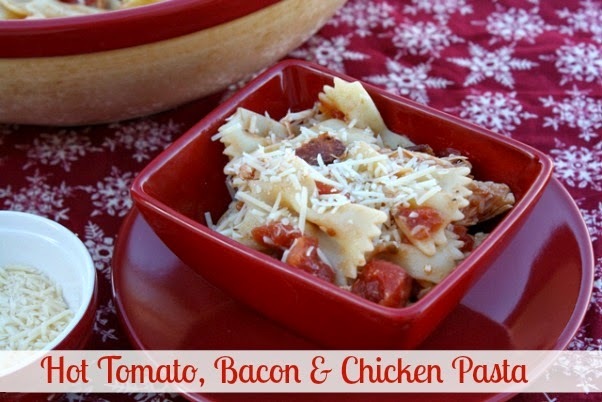 I would like to try to tomato bacon chicken pasta recipe it looks really good! Good ole pot roast reminds me of my childhood. Pot roast on Sunday with potatoes and carrots. A programmable slow cooker AND Stacey's book?! Count me in! Chicken and dumplings remind me of home. My mother would often make Roast with carrots and potatoes. It is now one of my favorites and reminds me of home! The recipe that always reminds me of home is macaroni and cheese--not the boxed stuff, but my mom's recipe with sharp white cheddar. I still can't make it as good as hers! Meat loaf and Ham hocks and beans with fresh out of the oven homemade bread! YUM! YUM! Hard to choose just one item that reminds me of home since almost everything I make reminds me of home. I learned to cook from many wonderful southern cooks such as my Mom, Dad, both grands, several Aunts and an Uncle. I guess if I had to choose just one it would be lettuce and onions with hot fat back drippings. Thanks for the chance to win. The dish that always reminds me of home and my mom's kitchen is a dish she called Come Without Calling... but to most of you, it would be Goulash! Mama's biscuits and sausage gravy. Thanks for chance to win. Spaghetti and meatballs always reminds me of home cooking! My grandmother's apple pie with whipped cream reminds me of home! My mom's homemade lasagne. Nothing beats it! I would make Shepard's Pie as we always had it when I was a kid. It was and still is a meal that everyone in the family will eat. Homemade macaroni and cheese with green onions on the side, remind me of home. It was a favorite growing up and now I make it for my family. It doesn't get much better then that! My Mom's fried chicken reminds me of home. I never have learned to make it as good as she did. Would love to win the cookbook. My Moms Spaghetti Sauce and Meatballs. My Mom went to her heavenly home in 2009, so the smell of her sauce brings me back home to her kitchen. When I was a kid my father was a big hunter. Anything game reminds me of home. Can't say I duplicate the flavors! I would love to win this cookbook! So many comfy home recipes. It would be a pleasure to try your recipes...the crockpot is an awesome addition to the giveaway. Crossing my fingers. Your Pecan Chewies recipe is very similar to a recipe my Grandmother made a lot and when I make that recipe it reminds me of home. Chicken and Dumplings remind me of my grandmother, she made the best chicken and dumplings. I can't duplicate hers but I finally found a recipe that comes close and I always think of her and the holidays she made these.